Diagram of the Angara rocket family. 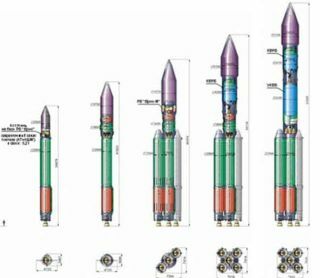 The long-delayed Angara rocket family, a modular system designed to replace a range of Russian boosters, has finished a series of ground tests and could be put in commercial service to replace the Proton rocket by the middle of the next decade. The Angara system was approved by the Russian government in 1995, but insufficient funding has repeatedly slowed the rocket?s development and pushed the maiden launch to at least 2012. Russian space officials hope the Angara will replace several vehicles, including the Rockot, Kosmos 3M, Zenit and Proton rockets serving the light, medium and heavy satellite markets. Officials foresee the Angara will launch Russian military, civilian and international commercial payloads. Frank McKenna, president of International Launch Services, said communications satellite launches will shift from the Proton to Angara around 2015. ?Some time in the middle of the next decade, there will a transitioning to the Angara system. As that evolves, we will announce further plans associated with that,? McKenna said. The Angara rocket first stage wrapped of a series of qualification tests in Russia last week, according to Khrunichev, the launcher?s prime contractor. The rocket completed three test firings between late July and Nov. 26 at the Rocket and Space Industry Research and Testing Center new Moscow. Called the Universal Rocket Module, the booster will be clustered in groups of three or five to loft medium-class and heavy satellites. Single first stages will be used for smaller payloads such as Earth observation spacecraft. The Angara 5 configuration would be used to replace the venerable Proton rocket. All launches of the Angara are planned from the Plesetsk Cosmodrome in northern Russia. The Angara?s core booster is powered by a single-nozzle RD-191 engine fueled by kerosene and liquid oxygen. The rocket will likely also use variants of the Breeze upper stage currently flying on Proton and Rockot vehicles. The RD-191 engine is a scaled-down version of the RD-171 and RD-180 powerplants successfully flying on Zenit and Atlas 5 rockets. Engineers will next begin test firings of the Angara?s second stage. McKenna said ILS still plans to employ the Angara system, but the U.S.-based firm wants to ensure the new rocket is ready to fill the role of the Proton before committing it to commercial missions. ?The testing is being done well, but commercial introduction of that won?t be until we?re certain that everything can be done with no gaps in continuity of service for support of the commercial launch industry,? McKenna said. A version of the Angara first stage first flew in August on a joint rocket project between Russia and South Korea. The mission fell short of orbit because the Naro 1 launcher?s payload fairing failed to jettison, but the rocket?s Angara first stage performed as expected, according to Khrunichev. The latest delay in Angara?s maiden flight is due to a shortage of funds to build the vehicle?s launch pad at Plesetsk, according to Russian news reports. When the Proton is phased out for Angara, it will mark the end of more than 50 years of service for the rocket, which has become a mainstay of the Russian launch industry. The Proton has launched countless military, science and space station missions since its debut in 1965. Commercial missions through ILS began in 1996. ?Between 1996 and 2009, the early part of this year, there were 50 ILS commercial launches,? McKenna said. ILS now has 24 satellites in its commercial backlog. ?We?ll be up to 75 launches commercially probably in the next two or three years. I expect there will be another 25 launches after that. That?s probably 100 commercial launches cumulatively for ILS,? McKenna said. Khrunichev and Proton subcontractors have implemented upgrades to increase the rocket?s payload capacity to geosynchronous transfer orbit by 1,200 pounds to approximately 13,558 pounds, more than six metric tons. ?I think there will be continued growth beyond that, but it?s kind of a marginal rate,? McKenna said. ?I think the Ariane system and our system are very well optimized for launching five-and-a-half to six metric-ton satellites. That?s why we did it and it?s why it?s been successful.? Khrunichev has also instituted a series of quality improvements after a series of Proton launch failures blamed on shoddy workmanship and foreign debris inside engines. The improvements first focused on the Breeze M upper stage after a ruptured exhaust gas conduit led to a rocket failure that stranded the AMC 14 communications satellite in early 2008. Subsequent quality improvements included system-wide initiatives at production facilities and sustainability investments for new equipment and better testing procedures, according to McKenna. Khrunichev also streamlined the Proton?s manufacturing process. The contractor now controls the building of about 75 percent of the rocket?s components, when measured by value, McKenna said. ?You have to build in a lot of testing and a lot of processes to get the systems to work properly every time,? McKenna said. ?Of course, we?ve done that as best as humanly possible, and we?re investing in some things in the future that might even improve it more. ?